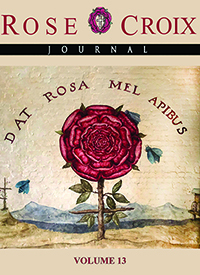 In the spirit of the free philosophic inquiry that characterized the Renaissance and the Enlightenment, the Rose+Croix Journal is an international, interdisciplinary, transdisciplinary, peer-reviewed online journal that focuses on topics that relate to the sciences, history, the arts, mysticism, and spirituality, especially interdisciplinary topics, and transdisciplinary inquiries that traverse and lie beyond the limits of different fields of study. These topics may relate to any of the arts and sciences and/or to other emerging fields of human endeavor. The Rose+Croix Journal is seeking papers for its next online issue. The deadline for submission of papers is February 15; however, authors are encouraged to submit their papers for the peer-review process as soon as they are ready. Both Rosicrucian members and non-members are invited to submit papers for consideration. For a full description of the requirements for papers, please view our Guidelines for Submission. Questions may also be sent to the Editor-in-Chief.